So the Holidays are about here and if you are one of the many thousands of people who are shopping early (I envy and praise your tenacity) you are already in the spirit. This truly is my favorite time of the year. Especially these next few weeks, as we finally begin to experience fall weather that will help us catch a glimpse of the holiday’s season. One of the joys during this time of year is the decorating. It is one of my favorites and I am usually chomping at the bit to put out my entire seasonal decor. Transforming our home from my current “theme”, (legos, dog hair and anything and everything Spider man), to a warm cozy burst of holiday fun. I was very excited when I met with Angelia Schifferle who shared with me her passion for helping folks decorate their home as well as some really cool planning tips to get ready for the holidays. 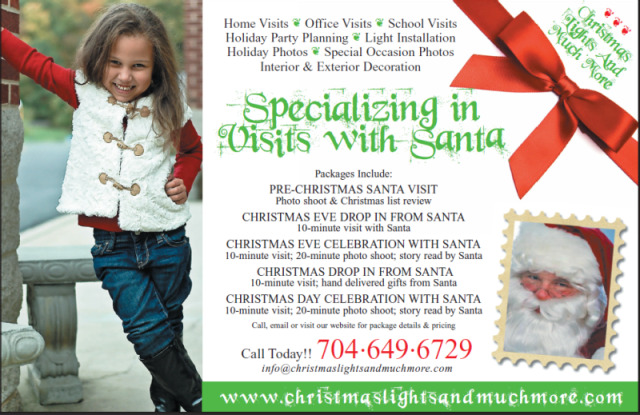 Angelia is one of the managers of “Lights Lights Lights” based here in Charlotte. Christmas Lights and More is their seasonal business focusing on interior and exterior Holiday Decorating as well as, in home Santa Claus visits. A cool concept, where Photos can be taken of your family with Santa, in your natural environment, at any location of your choice (indoor or outdoor). 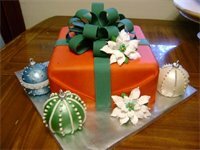 New this year, they are also teaming up with Susan Moller of “SuzeeSweetCakes,” to offer many wonderful options for holiday decorating and holiday treats including edible holiday centerpieces that will serve not only as a focal point on your holiday buffet, but also are incredibly delicious to eat. See photos below, yes those are CAKES! !